No one should expect Twitter, a volcano spewing hot takes, to deliver well-thought-out ideas about a complex transportation system designed for maximum carnage. (Denver’s seen nearly 10,000 crashes this year alone.) 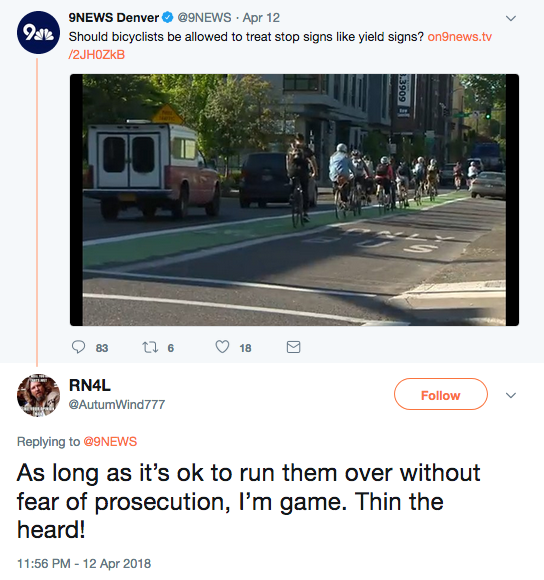 But when a reporter for the local ABC affiliate expresses concern for an inanimate object over a human being who just suffered a potentially life-altering blow to the head, Twitter can tell us something about the culture of traffic violence in Denver. The primacy of the car in our city, and the ubiquitous injuries and deaths that result, have led people to accept carnage as a daily cost of doing business. This casual disregard for human life is evident all around us, especially online, where people openly talk about killing others because of how they choose to move around. 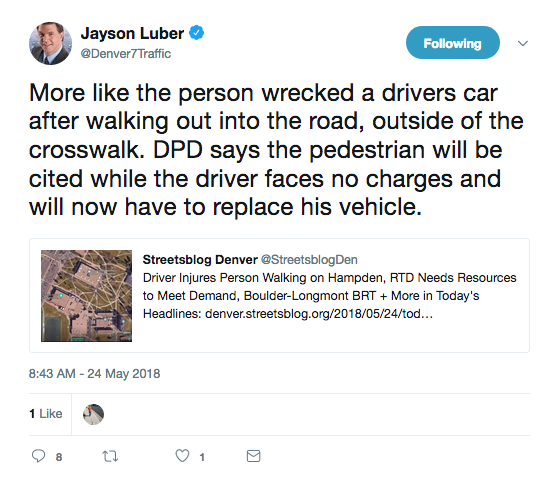 Or take Luber’s tweet: Is he saying that because the pedestrian was outside of a crosswalk, he essentially got what was coming to him? If so, how is that okay? It’s not about political correctness — it’s about realizing that these tragedies are preventable instead of rushing to blame the victim. We’re talking about a five-lane highway not designed with pedestrians in mind that only received a sidewalk on its south side last year. bad tweet. Would it change your take if it had been a child that ran out in the street and got hit? Still outside crosswalk. Or a blind pedestrian? Should the driver be able to stop in those cases and not sue the vulnerable human? One tenet of Vision Zero, the Hancock administration’s goal to end traffic deaths, is that streets should be forgiving, so when people do make mistakes they don’t have to pay with their lives. Denver needs better infrastructure, but it also needs the public to grasp the fact that these incidents are preventable with better engineering and enforcement. Let’s see…driver was doing what they were suppose to and pedestrian was not…If both were doing things lawfully, this wouldn’t have happened. And yes, this was preventable by using the crosswalk. Now maybe you have a point that there is a lack of them in this stretch of roadway, but that’s not the point. We see this along other sections of roadway with plenty of crosswalks. MT… lol, blog etiquette is you can vigorously disagree/attack one’s ideas but do NOT make personal attacks. In-other-word try to be substantive. Just stay off of the sports blogs; strictly enforced on those sites. Sports is not (usually) life and death. Crossing the street is, and it shouldn’t be. Can’t stand the thought that it can easily be me or someone in my family killed by a car and this is the way we’ll be treated. It’s cruel and pointless to design a system that’s ineffective, inefficient, and regularly results in unnecessary and arbitrary death. When the system itself is broken it doesn’t matter whether behavior was lawful or not, since often the lawful choice is either non-intuitive or unhelpful, the system needs to be fixed. It’s fair to say that Hampden Ave which is a state highway was not designed to be pedestrian friendly. But I’ll tell you what; west of Tamarac Dr the social scene was fabulous back in the 1970’s. 🙂 Just a guess; you probably missed those times. I happen to be familiar with that area. At 4:00 am, pedestrian presumably just left the Centerfold Show Club. The only other thing open at that time is the 7-Eleven couple of blocks away at Florence and Girard. Where was this guy going? There’s nothing across Hampden except the golf course. To the west there’s a Walmart and apartments off of Dayton. A few blocks to the NE there apartments/commercial on E Dartmouth. If they said he’d been hit on S Galena that would make more sense. On Hampden? Makes no sense. So presumably the driver of the car is no different than an “inanimate object,” a nobody? I would be horrified if someone stepped out in front of me wearing dark clothing that wouldn’t be seen until they’re directly in front of the headlights. Not condoning Luber’s response but he doesn’t represent the rest of the world; he speaks for himself. A couple of weeks ago I had a conversation with a public works manager of a Colorado town. Not Denver. He said that they weren’t going to repaint crosswalks because “crosswalks just encourage people to walk into the street and get hit by cars.” The mind reels.